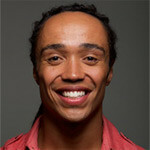 Kenneth ‘Intrutor Polvo’ Clarke has been training, teaching and performing with Axé Capoeira for over 15 years. He is a current Axé Capoeira Performance Team leader, and a In School Programs Leader with over 1000 shows and 100 school programs successfully completed. Polvo travels to Brazil annually and has competed in numerous Capoeira events in Vancouver, Victoria, Sau Paulo (BR), Recife (BR), Forta Leza (BR), Salvadore (BR), Seattle, Calgary, Toronto, Kansas City, and Santa Cruz. In 2007, Polvo Placed 1st in the advanced category during the Axé Capoeira Kansas City Capoeira Competition.